Better Being Hospital Walk-through | POV A POV walk-through of Beike's partner treatment center, Better Being Hospital. Founded by Dr. Torsak Tip-pairote, BBH is the origin of Functional Medicine, and is located in the heart of Bangkok Thailand. BBH provides world class healthcare with a dedicated staff of M.D.s, nurses, occupational and physical therapists, and a nutritionist. BBH Standard Patient Room A standard room at Better Being Hospital. Beike Treatment Partners: Better Being Hospital Dr. Hu and Dr. Torsak of Beike Biotechnolgy and Better Being Hospital explain and review the partnership and goals of the two companies moving forward. It was a pleasure to have Dr. Torsak visit the Beike Headquarters in Shenzhen, China. 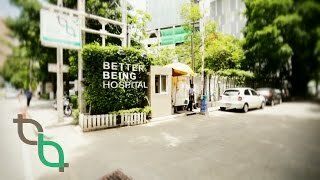 For treatment options with Beike stem cells at Better Being Hospital, visit www.stemcelltreatmentnow.com.